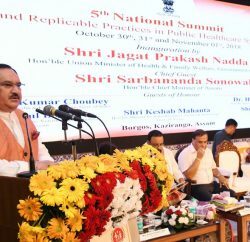 Shimla: A New Health Policy has been formulated for ensuring universal and comprehensive health care nationwide for which adequate funding would be made available to the states. 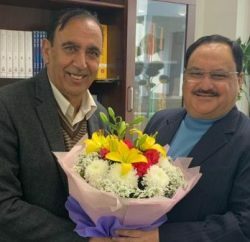 Union Health Minister JP Nadda, in a review meeting of Health Department of Himachal Pradesh, today, said the Government was going for universal free health screening for six diseases including hypertension and cancer. This scheme will be initially launched in 100 districts of the country. The screening will help in detection and diagnosis of chronic diseases. ‘Test and Treat” scheme for HIV patients would also be a component of New Health Policy, he added. He said India has geared up to provide world class health care facilities to its citizens. The government has been providing best mother and child care facilities to women in the country. The government has been taking care of two crore of pregnant mothers every year by providing them free medical treatment in government hospitals. He asked the Doctors to prescribe generic medicines which were mandatory by law. He also stressed upon the need to enhance communication with the patients so that every patient went satisfied from the Hospital. He said AIIMS would be set up soon in the State. He complimented the State for better health indicators in spite of topographic problems in the State. 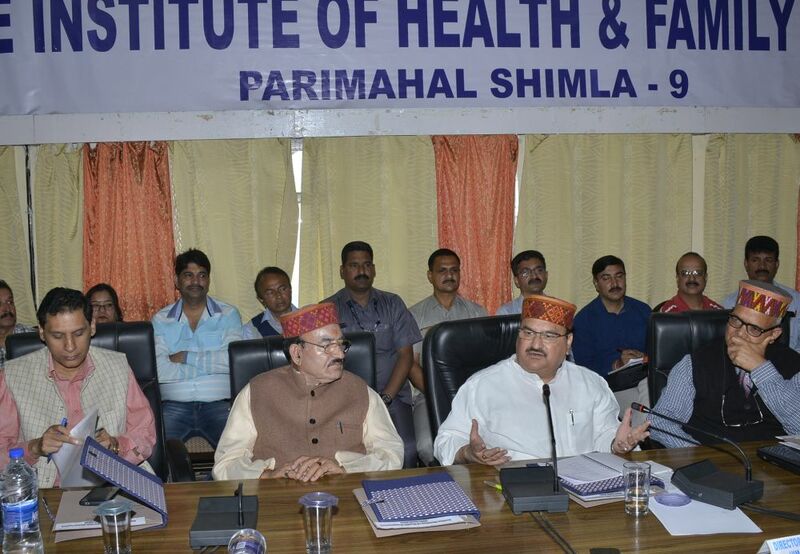 Health & Family Welfare Minister Kaul Singh Thakur assured Union Minister to implement national health programs and schemes as per the health policy mandate. 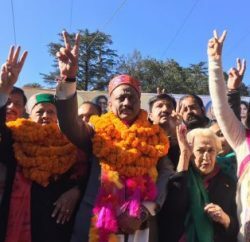 He said the health indicators of Himachal Pradesh were better than other big states in the country. Total fertility rate is 1.7 against national average of 2.3, infant mortality rate is 28 which is 37 in India and under 5 child mortality rate is 33 against national rate of 43. He said the State has fixed the target of TB elimination by 2025. Chief Minister has recently announced a scheme “Mukhya Mantri Kshaya Rog Nivaran Yojna” and working on the same in a mission mode, he added. Thakur urged the Union Health Minister for providing liberal funding to the State for strengthening and improvement of infrastructure in health institutions and new institutions. He said the Trauma Centre in IGMC was of level one and expected the same status for Tanda also. He also urged to sanction 9 more trauma centres for the State for which case had already been sent. He said the budget in National Health Mission was Rs. 214 crore in 2013-14 which has now been decreased to Rs. 177 crore that should be enhanced for implementation of various programmes. He also demanded more funds in TB programme under special category state. He requested for four more CBNAAT machines for DDU Shimla, CH Nurpur, CH Paonta Sahib and CHC Nalagarh. He also asked to provide Rs. 5 crore for TBS Dharampur. Earlier, Principal Secretary Health Prabodh Saxena informed that health sector had transformed rapidly. He asked CMOs and Medical Officers for strict implementation of all health schemes viz-a-viz their timely reporting and accurate surveys. He asked for cent percent immunization and stress on maximum institutional deliveries. Director Health Dr. Baldev Thakur, Director National Health Mission Pankaj Rai, Director Health Safety & Regulation Captain Raman, CMOs of all Districts, BMOs and other Medical Officers attended the meeting.